Last week saw three disparate companies hiking their payouts -- a workplace safety goods maker, a REIT, and a regional banking group. Last week was one of those bare periods between earnings seasons when there are almost no dividend raises. The landscape wasn't entirely desolate, however, as three somewhat unheralded companies chose that time to declare a boost in their payouts. We're still some time away from the year's third earnings season, so we shouldn't be surprised if next week, and the following, are similarly thin. In the meantime, let's take a look at our three recent raisers. The first member of our trio, Brady (NYSE:BRC), is its only Dividend Aristocrat -- one of the market's few stocks that has raised its payout at least once annually for a minimum of 25 years running. It's maintaining that status with a 1% bump in the existing quarterly distribution, to nearly $0.21 per share. That's modest, considering that the company, which concentrates on the provision of workplace safety goods, is coming off a good quarter and fiscal year. For the former, it flipped to a profit, to the tune of $25 million. This was on net sales that declined, although not worryingly so, to $282 million. For the full year, the dynamic was much the same on the top line, which landed at just over $1.1 billion. Profitability, however, skyrocketed to over $80 million from the 2015 tally of nearly $3 million. Thanks to that, Brady's operating cash flow saw a nice jump over the previous year, as did its free cash flow, which was nearly twice what the company spent on dividends and share repurchases. Meanwhile, it's expecting full-year profitability that should meet or exceed fiscal 2016's level, so I think it'll be able to keep growing its distribution in the coming years. Brady's improved dividend is to be handed out on Oct. 31 to stockholders of record as of Oct. 11. At the current share price, it would yield 2.4%, slightly bettering the 2.1% average of dividend-paying stocks on the S&P 500. A dividend raise is in the cards for Ramco-Gershenson Properties Trust (NYSE:RPT), a REIT that owns and manages shopping malls. The company is lifting its quarterly distribution by 5%, to $0.22 per share. Its recent fundamentals provide the justification for such a move. In its second quarter, bolstered by an encouraging 10% year-over-year increase in rental income, the REIT notched healthy gains in both revenue and funds from operations, or FFO (arguably the most important profitability metric for REITs). 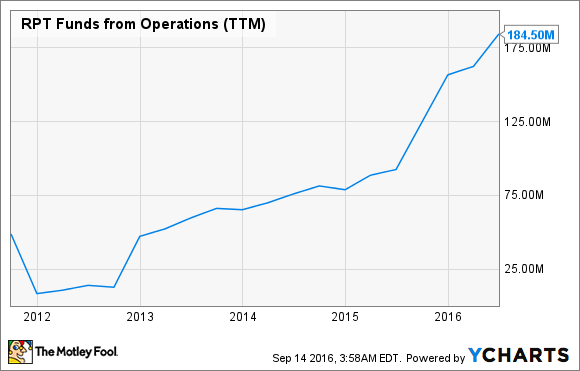 RPT Funds from Operations (TTM) data by YCharts. What helps is a slimmed-down and apparently higher-margin portfolio. This is coming closer to the company's stated goal of "owning a portfolio of high-quality, high-growth shopping centers that are the dominant retail destinations in the communities they serve." 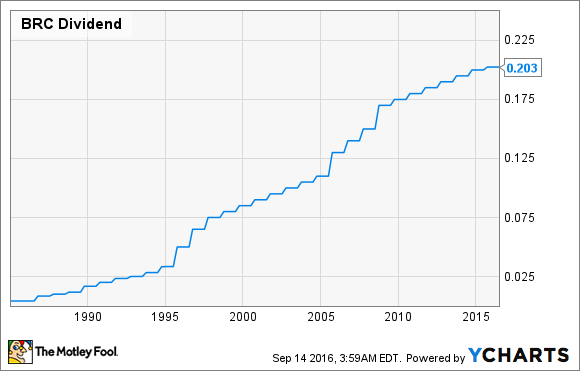 Ramco-Gershenson's dividend has steadily been on the rise since the beginning of this decade. Its most recent payout ratio, on the basis of the operating FFO metric it favors, was a conservative 60%. Although the company is anticipating a small drop in FFO for this fiscal year, it's adjusting to a business model that ultimately promises to be more efficient and, hopefully, profitable. So given that there's plenty of room for this hike, and improved FFO might be around the corner, I'd bet on the REIT continuing to raise the payout into at least the proximate future. Ramco-Gershenson's upcoming payout will be dispensed on Oct. 1 to investors of record as of Sept. 20. It would yield a theoretical 4.9% on the most recent closing stock price. Georgia-based regional banking concern Ameris Bancorp (NASDAQ:ABCB) is the clear victor among our trio in terms of raise percentage. It has boosted its quarterly payout a full 100%, doubling it from $0.05 per share to $0.10. That's the company's highest dividend boost since last decade's financial crisis. Actually, it's the only boost across that stretch of time. The bank pulled the trigger because it has notched several notable improvements lately. In its most recently reported quarter, both total assets and net interest income saw a 34% year-over-year increase. Granted, that was at least partially due to a set of small acquisitions Ameris Bancorp has completed since the beginning of last year. But it's not only the extra financial muscle -- the company seems to be consolidating the new assets pretty well. Its overall efficiency ratio is down nicely, to 63% in said quarter from 74% and 75% in the two preceding quarters. The company also posted its best return-on-assets figure in quite some time. 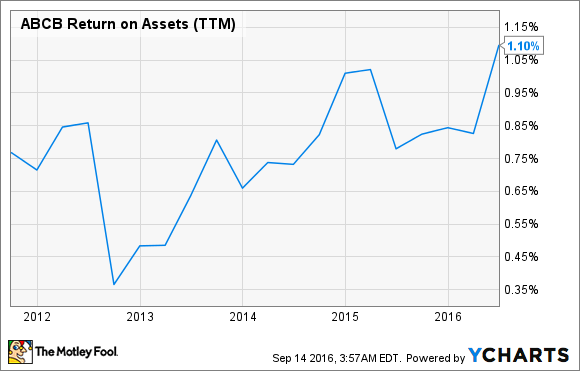 ABCB Return on Assets (TTM) data by YCharts. This bank is doing fine these days, and the good times should continue to roll, at least through this economic cycle. If the Federal Reserve ever gets around to raising rates, Ameris Bancorp will benefit along with the rest of its peers. This company isn't an eager dividend booster. Yet I'd imagine the good momentum in fundamentals will encourage it to at least maintain its current payout going forward. Said payout is next to be dispensed on Oct. 11 to shareholders of record as of Sept. 30. At the current share price, it would yield 1.1%.